Named after the famous El Cortez Hotel, this is one of downtown San Diego’s oldest residential neighborhoods. Victorian-style homes, condominiums and apartments provide a variety of living opportunities. Located just outside the bustling downtown, this hilly neighborhood boasts beautiful views of Balboa Park, the San Diego Bay, Pacific Ocean, and the city below. A new addition to the neighborhood, Tweet Street Park, is a great place to take a stroll. The Cortez Hill Neighborhood has a great community feel and although it is located in Downtown, it feels like a cozy urban neighborhood. Because the majority of Cortez Hill is occupied by Residential buildings, it doesn’t have the commercial feel of many other downtown neighborhoods. 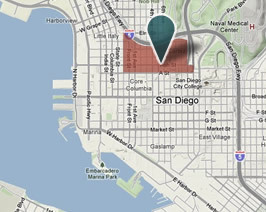 Parking in Cortez Hill is as good as it gets in Downtown San Diego.